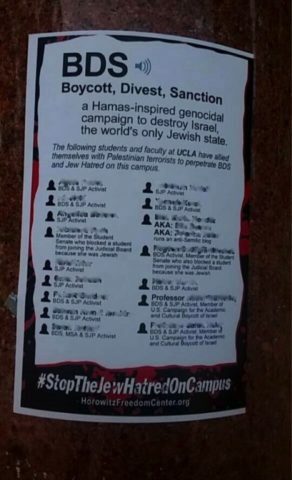 These posters are the latest in a string of virulently anti-Muslim and anti-Arab posters plastered across college campuses in recent years by the David Horowitz Freedom Center, whose founder, David Horowitz, has been called “the godfather of the anti-Muslim movement” by the Southern Poverty Law Center. Since 2007, Horowitz’ center has organized Islamo-Fascism Awareness Week programming at hundreds of campuses. He has also spoken virulently against civil rights, LGBT equality, feminism, and much more. At UCLA, his targets have expanded from simply attacking students to also attacking two black faculty members who are vocal supporters of Palestinian rights. The linking of alleged Jew-hatred and the boycott, divestment, and sanctions movement (BDS) is part of the larger campaign to falsely equate criticism of Israel with anti-Semitism. While groups like the David Horowitz Freedom Center slander SJP activists as “terrorists” and “Jew haters,” other right-wing organizations like the AMCHA Initiative, StandWithUs and the Zionist Organization of America (ZOA) work to suppress the growing student movement for Palestinian rights by falsely accusing its leaders of anti-Semitism. From the New York State Legislature to the University of California Regents, these groups are pressuring campus administrators and local politicians to support legislation that falsely equates BDS activism with anti-Semitism, so as to set a dangerous precedent for stifling speech and suppressing activism on campus. We call on SDSU, UCLA and all other universities, to protect these students’ rights and safety. We call on them to denounce the posters and all such attempts to accuse students of bigotry because of their political views. We call on them to take proactive steps to make certain their campuses are a safe place for Muslim members of the school community, as well as for all those who speak out of political conviction and a commitment to justice. 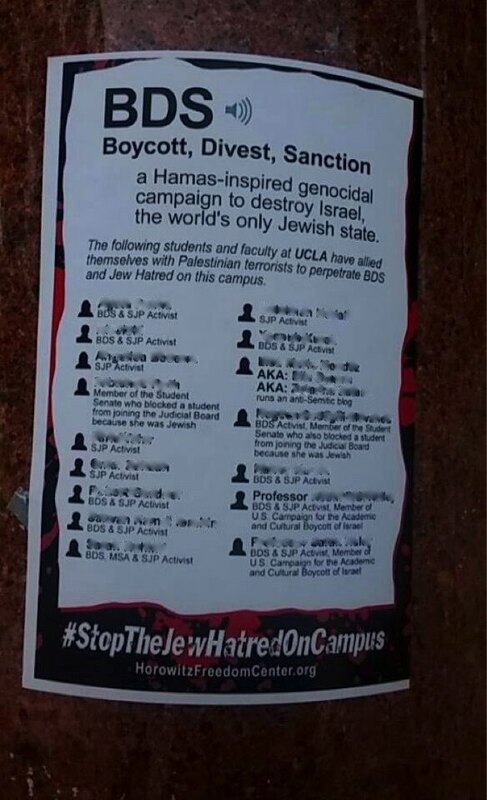 In the past, administrators have reacted slowly and weakly to Horowitz’s hateful posters. This has provided him with an opportunity to escalate his attacks to the unprecedented and dangerous level of targeting individuals. 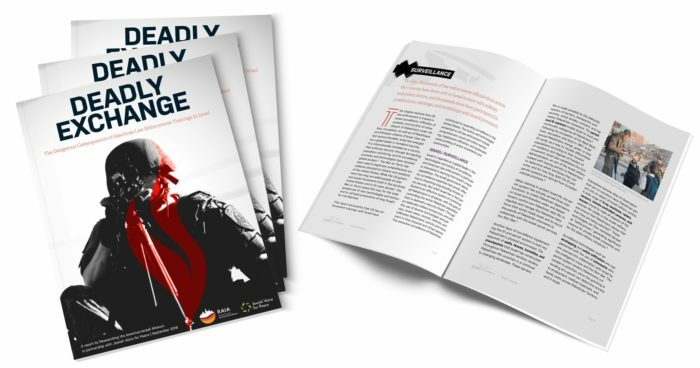 The administration’s response to these new posters must, therefore, also be escalated, and must demonstrate that continued attempts to smear and endanger student activists will only backfire.